There’s just something about those traditional red and green holiday colors I love. 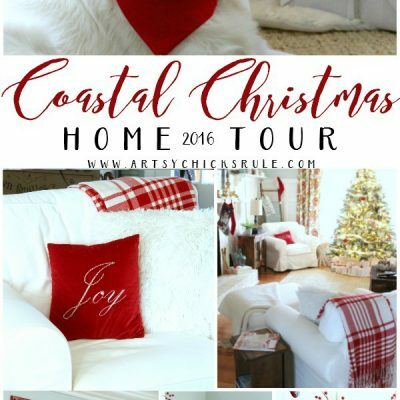 I decided to keep it traditional again this year with my festive Christmas home tour, part 1. 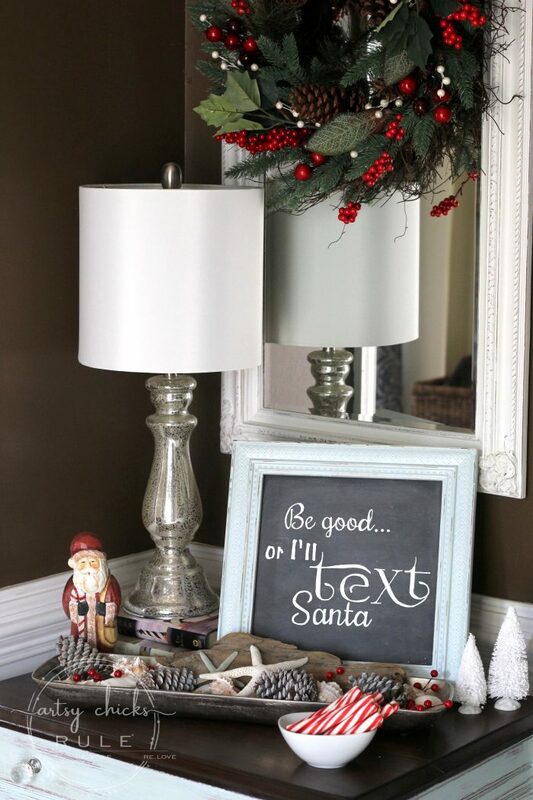 It can be tough to come up with new and different ways to use these decorations year after year. But I try hard to change it up! 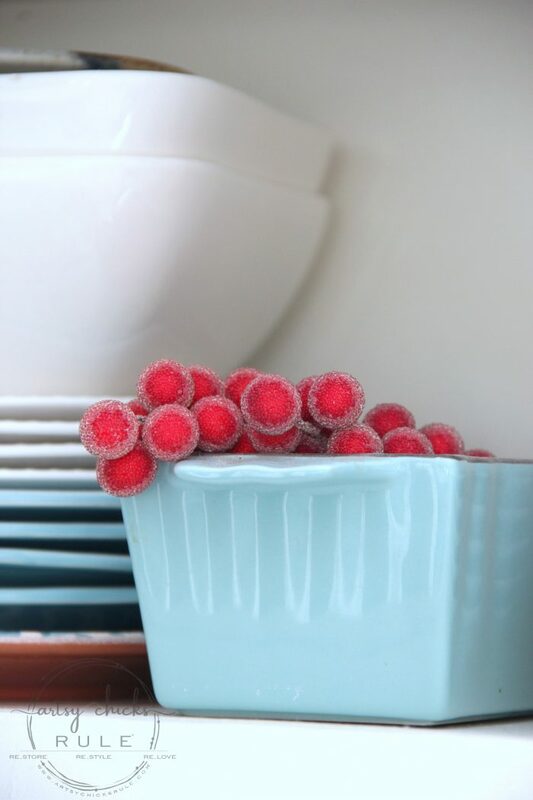 I do always add these cute peppermint sticks, usually in the entryway. You can find them at the Dollar store. And I do add in a few new things each year so that keeps it somewhat fresh. 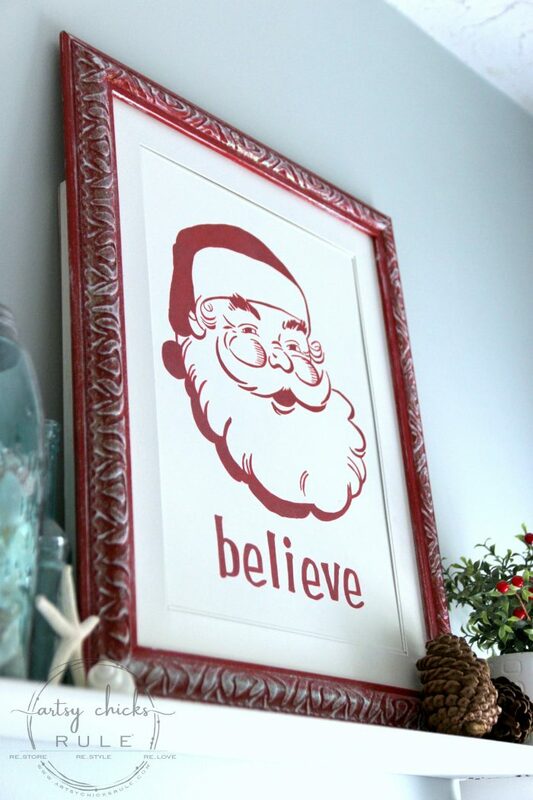 And can you guess what’s hiding behind the Santa sign chalkboard? One of the 5 diffusers I have in my home. I just love them and the natural scent they provide. Plus, having one at the front door is the perfect spot for it. I’m using my fave blend of orange, cinnamon, clove, vanilla and spruce right now. 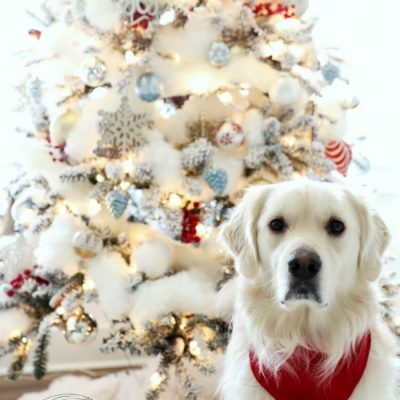 Perfect for getting in the holiday mood. 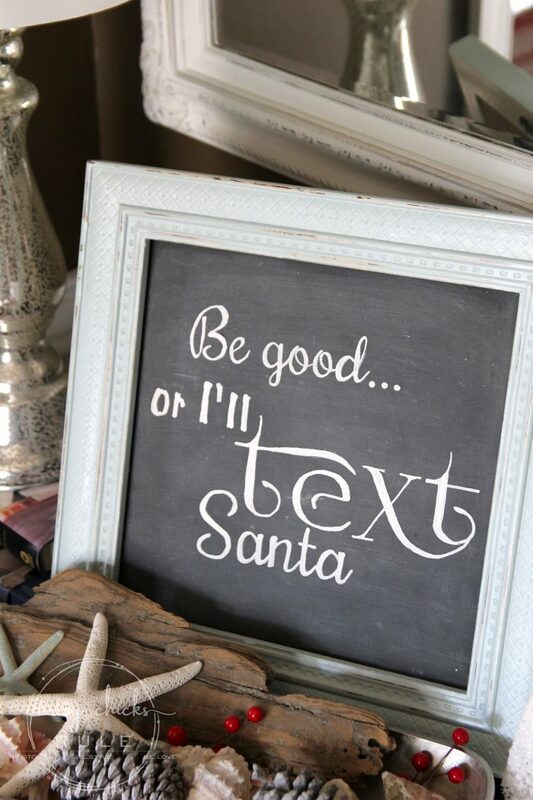 This “be good” Santa chalkboard was a Christmas project from a few years ago. 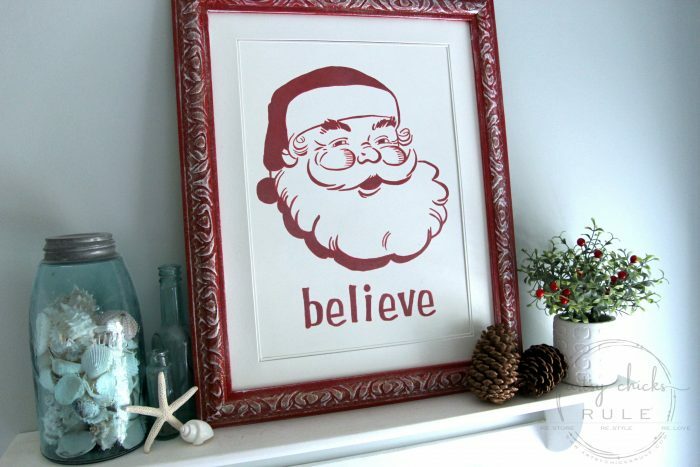 The little Santa was a also a thrift store find. 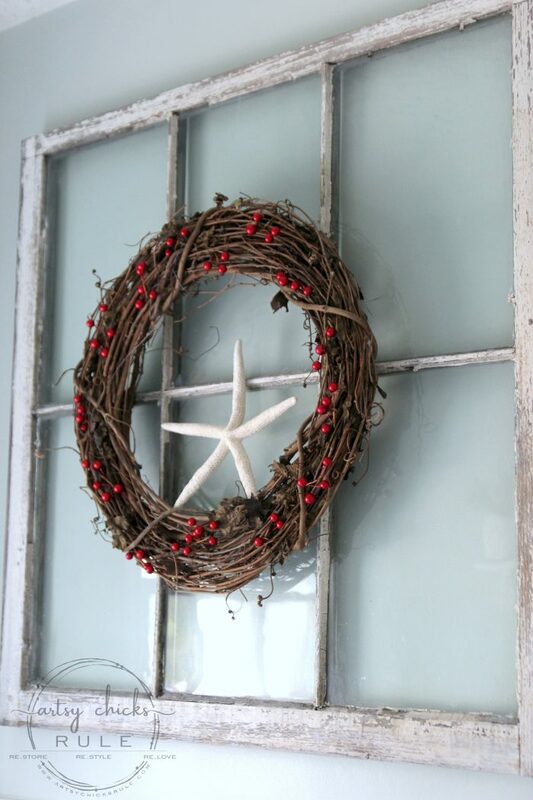 And it’s easy to add holiday decor to the existing dish of seashells with simple red berries and pine cones. It was a bit too much RED, so I added in a few white berries here and there to break it up somewhat. 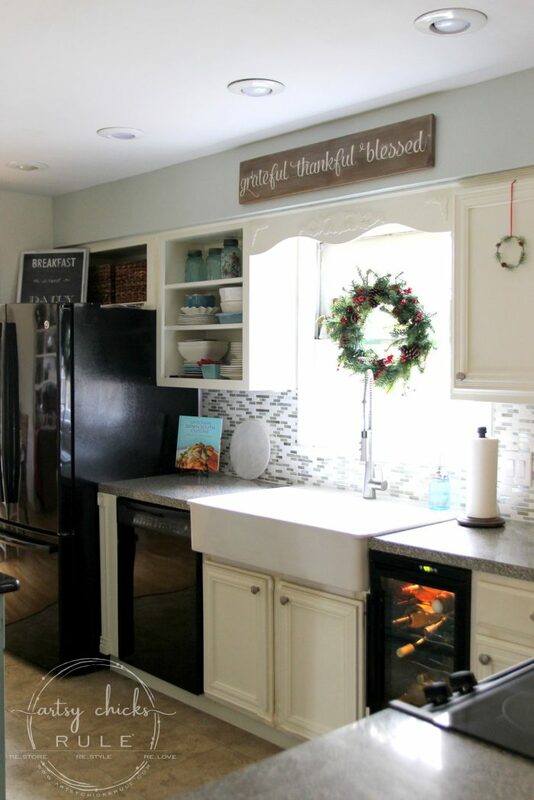 From the foyer, you enter the kitchen. 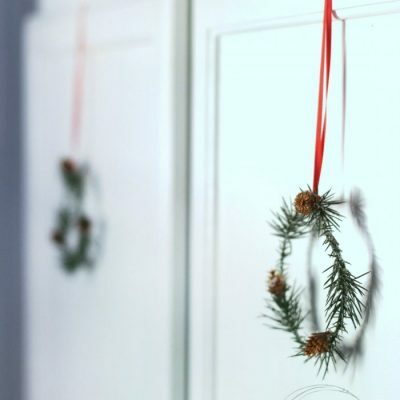 I’m really loving the new addition of the DIY mini wreaths I shared earlier this week. 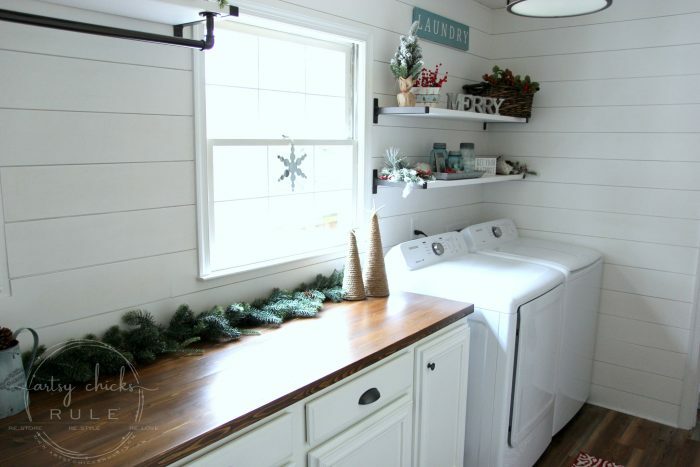 This is the first time I’ve hung a wreath on the window over the sink. I think I like it there! I still love my paper towel holder below! You can see the details on it >>> here. 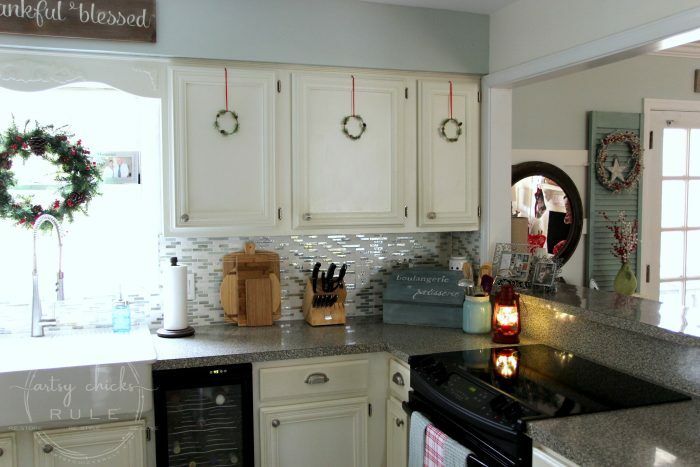 How about a simple splash of holiday cheer inside the dish on my open shelves? 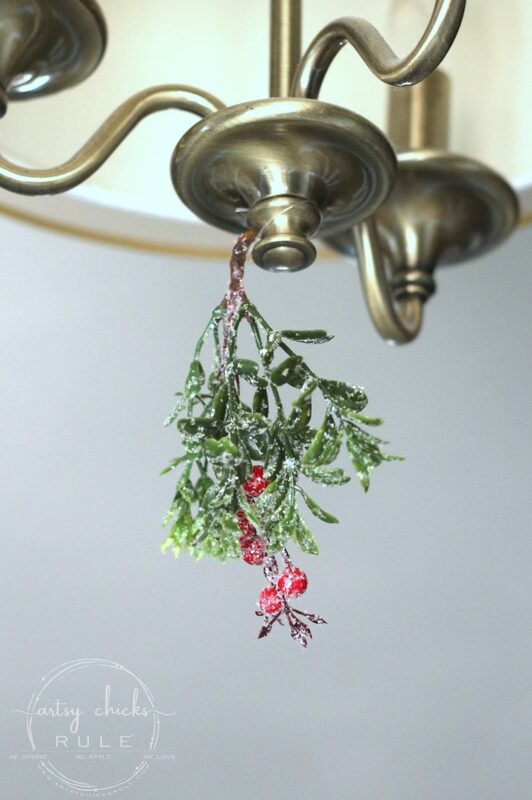 Easy way to add a holiday touch. And check out this little cutie I just picked up at Wal-Mart yesterday? 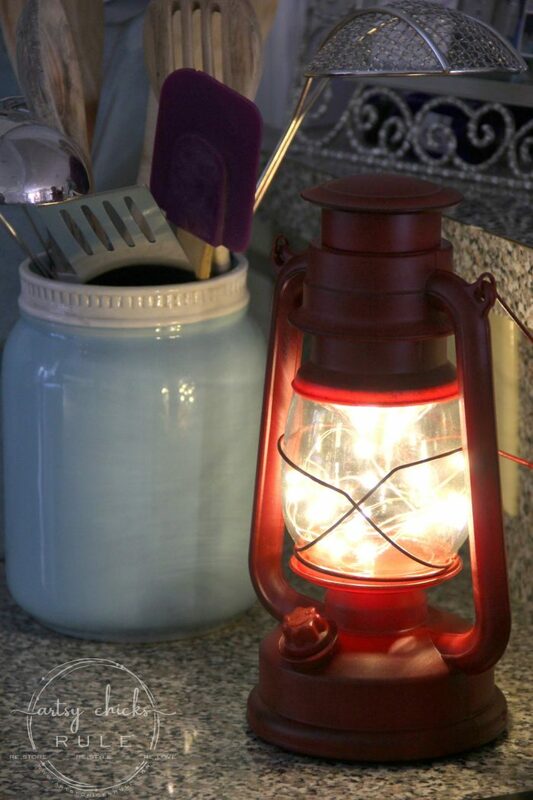 You can find the blue mason type utensils jar here. 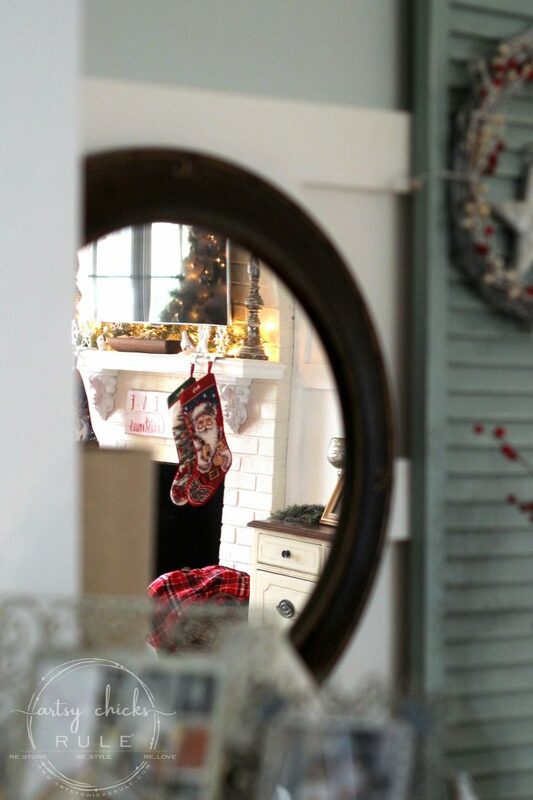 I love catching a reflection in a mirror….. Looking into the kitchen from the family room. I’ll be sharing that room soon, too. 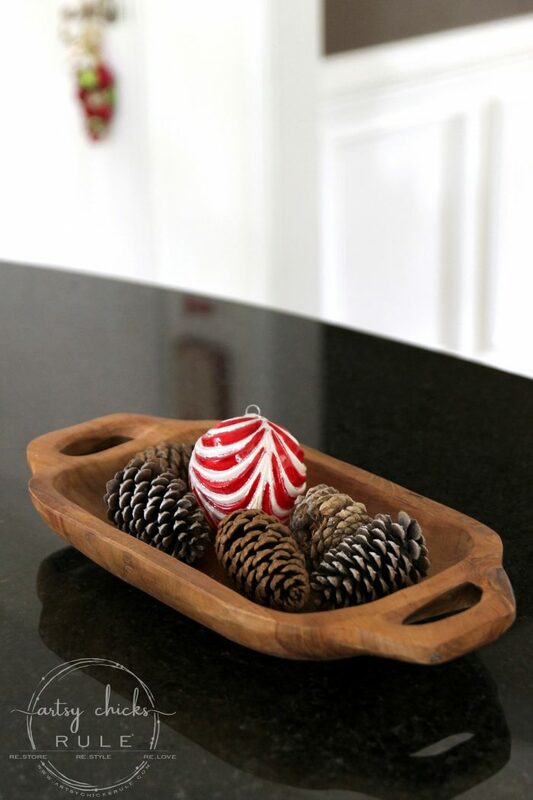 I kept it simple and added a few pines cones and this big, ole red and white striped ornament. 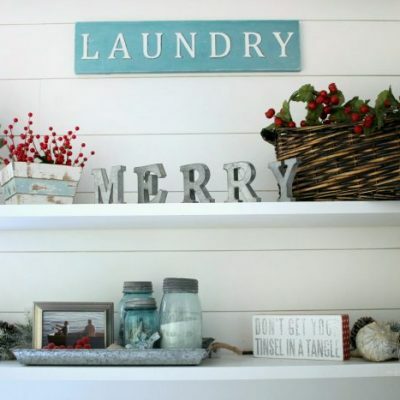 And on the other wall is this…..
That shelf is the perfect place for Christmas cards and where I usually display them each year. 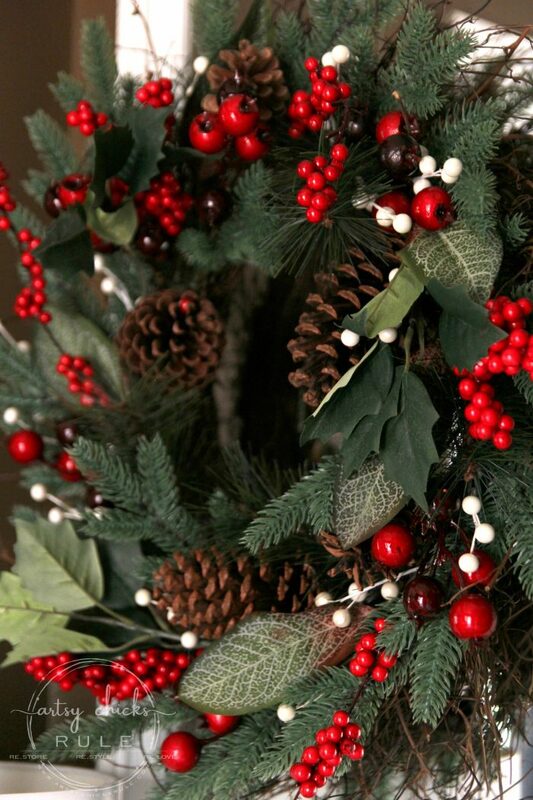 The wreath got a few red berries. 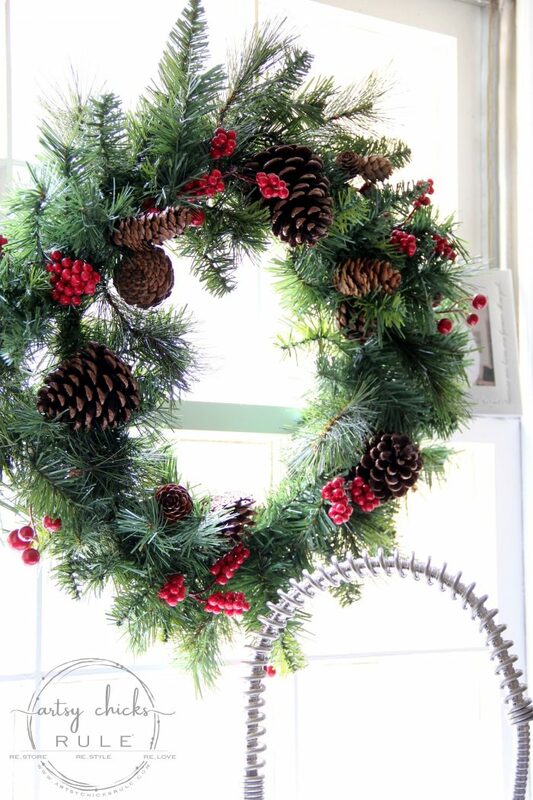 I’ve mentioned in other posts how I like to just stick a few red berry stems into my existing wreaths to create holiday decor. 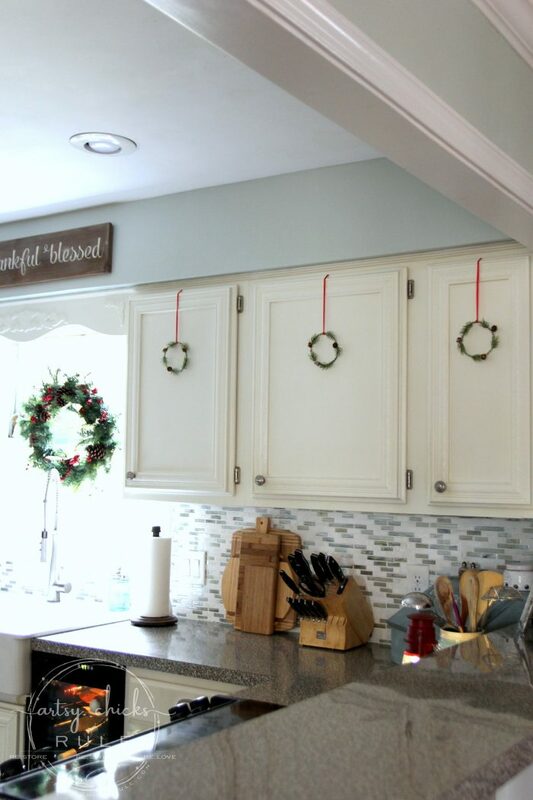 It’s so much easier than taking them down and replacing them with regular holiday wreaths. And cheaper, too! I added big bunches to this one. I don’t glue them in, I just stick them in and they always stay just fine. This way I can just pull them right back out at the end of the holiday season. I made that wreath awhile back. The bathroom got a little of the same as last year. 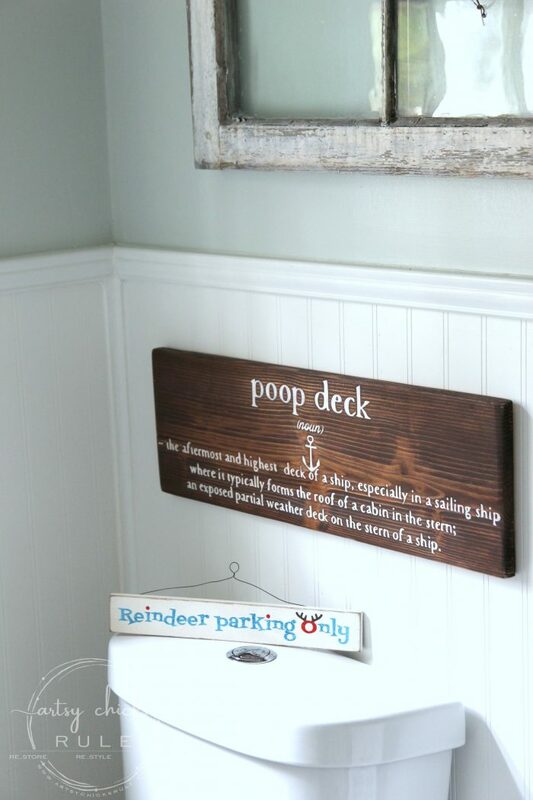 Except I didn’t have that little “reindeer parking only” sign. I’m still loving this old window that came out of a 100 or so year old house. 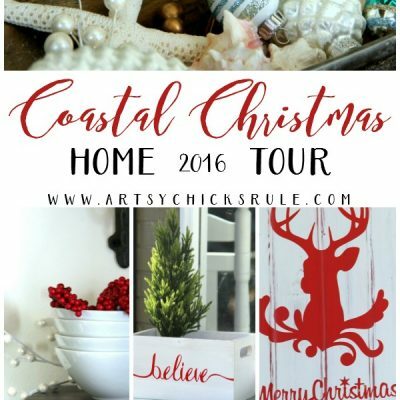 It was the perfect addition to my “Coastal Bath Makeover“. Instead of removing this twine wreath, I also gave it a few berries. On the shelf opposite is this fella….. I added a few simple berry stems in my greenery and 2 pine cones to the shelf. Simple! And I like easy decor (obviously ;) ). 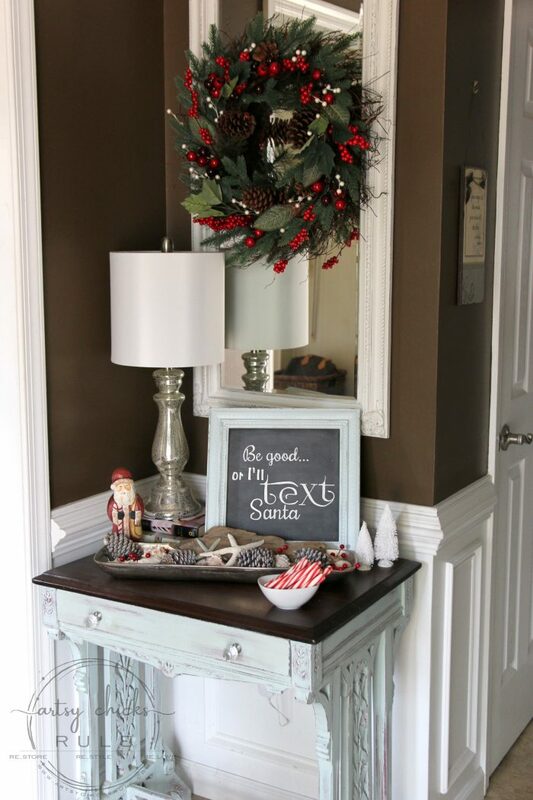 As is shown in >> this tutorial I did on making a sign to cover up an existing picture…without removing it from the wall. Less stuff to move around and store. I have enough of that anyway with the holiday decor so when I can get away with leaving something up, I do. 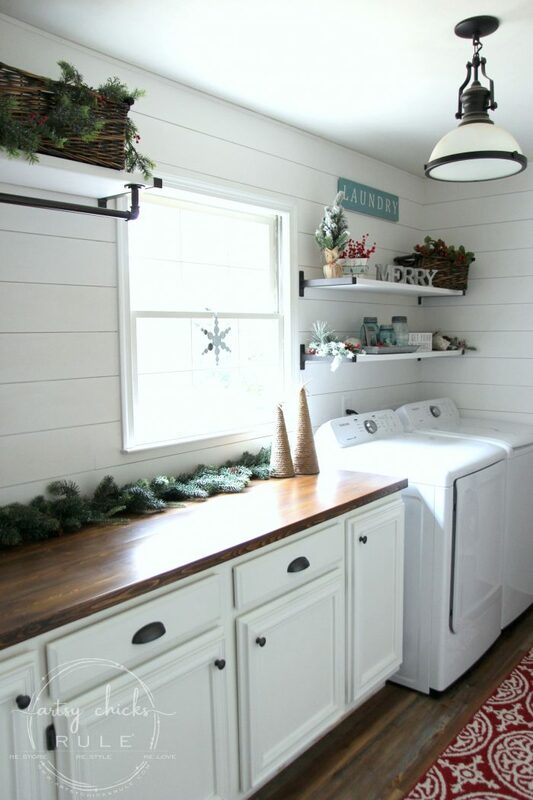 And let me show you what I added to my festive laundry room! That greenery along my wood counter top. It was at the very bottom of one of my storage boxes under all the lights. I couldn’t find it to decorate with (I have 2 of those actually) so bought a couple new ones. I didn’t decorate the tree until last so had no clue they were under there. I hope you enjoyed visiting my home. I’ll be back next week with with my Trash to Treasure friends and a brand new “treasure”! 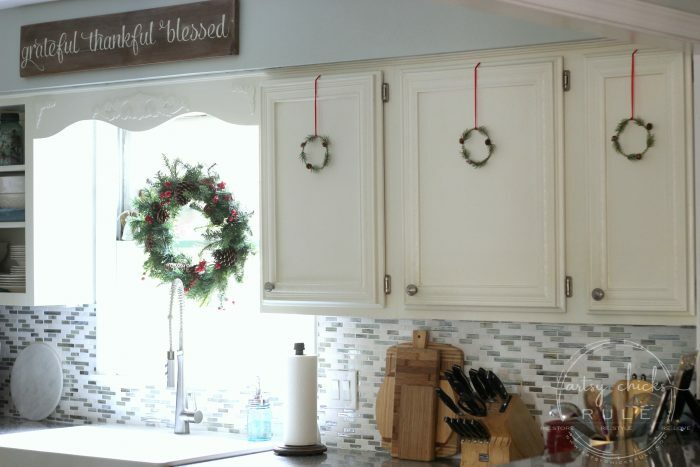 How do you hang the wreaths on your mirrors…..and are the tiny wreaths on the kitchen cabinets attached inside and ribboned over the top??? 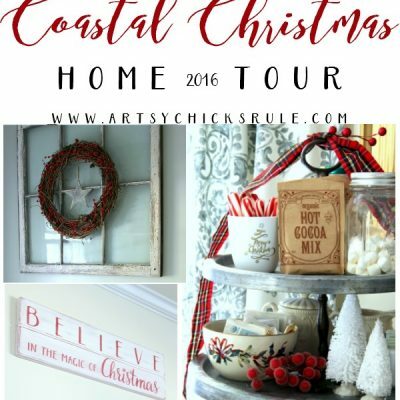 I love the way you combine coastal with a modern farmhouse look. We have a lake house all done in a “beachy” theme. Since we moved here full time I am looking for a more comfy cozy vibe for daily living. You are my inspiration! Thanks for sharing. 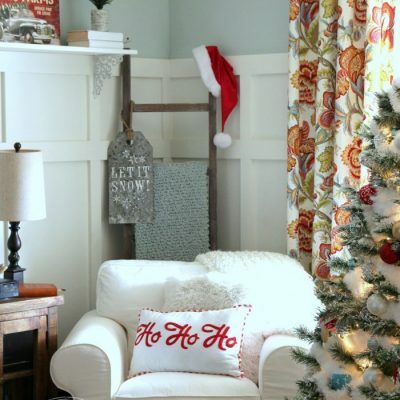 Hi Nancy, I always love your posts and I really love how you’ve transformed your home. 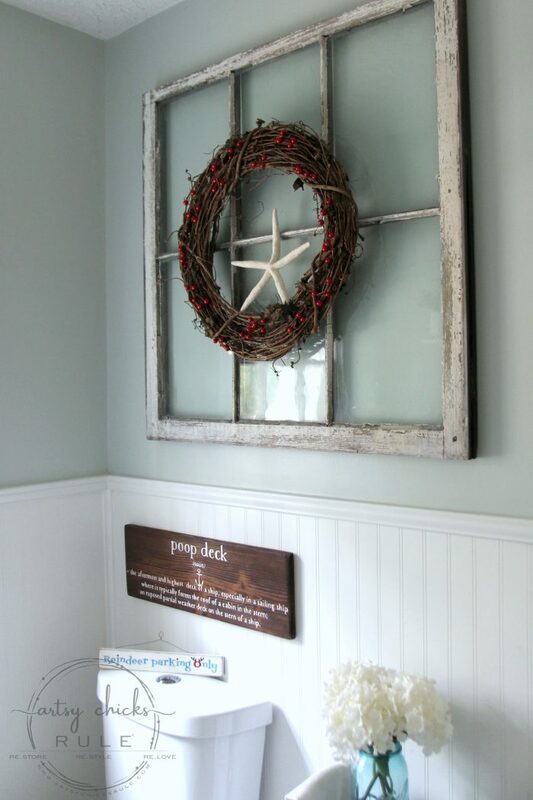 HOW are you hanging your wreaths on mirrors/windows etc? Are you using suction cups? 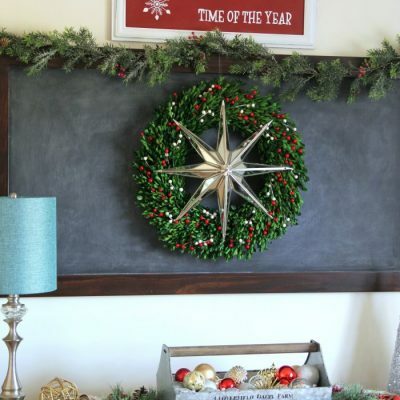 I’d love to do some indoors, and also on the outside of my front door, but on that one especially, there is nothing to hang a wreath on. My husband will not be okay with any over the door hanger as it ruins the door seal. So… so far, no wreath out there. Beautiful, thank you for sharing your special touches. 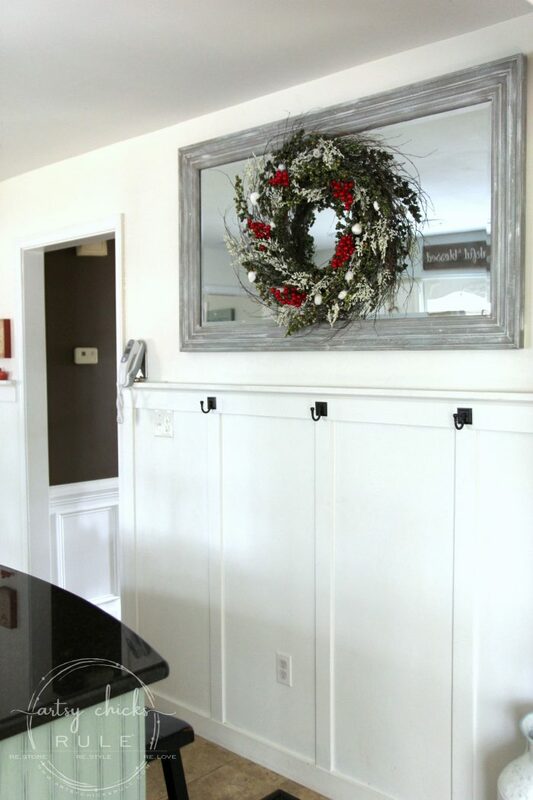 I am going to borrow your idea of hanging a wreath over a mirror. 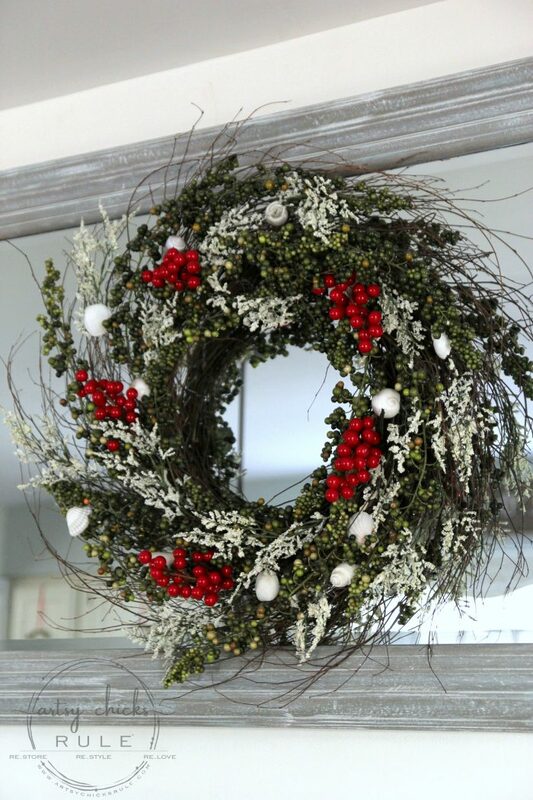 I have a wreath that makes it’s rounds…no pun intended lol….the entry mirror will be it’s home this season.